Yet, with the Cards victory all but assured in the top of the seventh inning, many of us turned our attention elsewhere for a bit — as in to ESPN2, where the top of the ninth inning in Atlanta was beginning. The score was 3-2 and Braves closer Craig Kimbrel was in. Placido Polanco, our old pal, started things off right for the Phillies with a single. After a strikeout, Kimbrel walked two to load the bases. And Chase Utley delivered, with a game-tying sacrifice fly. And, once the Cards game ended, they joined the rest of us in watching that game. The 13th inning proved to be the lucky one for the Cardinals — the Phillies took the lead as Hunter Pence singled with two on base, then quickly retired the Braves. That completed the Atlanta collapse and started the celebration for the Cards in Houston and those of us throughout Cardinal Nation. The clubhouse absolutely erupted, with joy, shock, relief and excitement. Forty or so grown men hooted and hollered like little boys, drenched each other with champagne and beer and chanted their trademark slogan, “Happy flight!” It’s what they yell in the clubhouse when getaway day ends with a win — but no getaway day has been quite like this one. 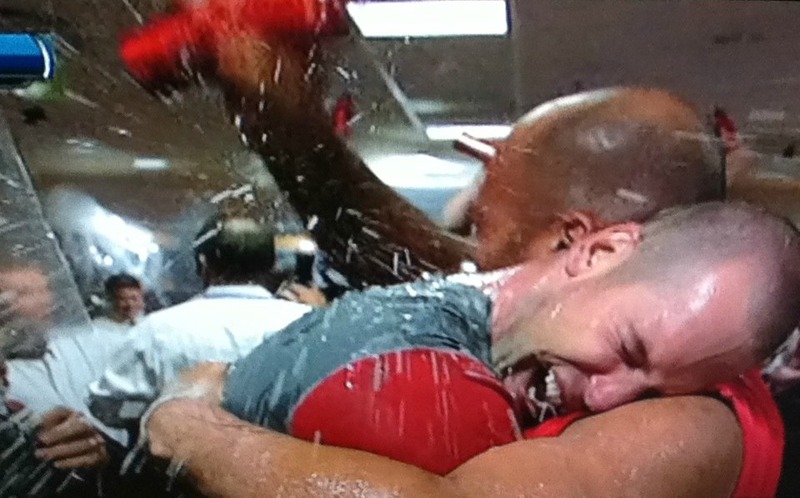 So, now, a time to celebrate and look back on the journey that’s brought the Cardinals to the playoffs. Then, Saturday, the games begin — and all records are cleared. The Phillies are 0-0 now, just like the Cardinals. And with the way these past five weeks have gone, there’s really no telling just where the story of the 2011 Cardinals is going to end. This entry was posted in 2011 Season and tagged Chris Carpenter, Five years ago today ..., Game 162, Wild card by Christine Coleman. Bookmark the permalink.